Professionals looking to add design thinking as a top skill on their résumé can now master it with a new online program from Rochester Institute of Technology. 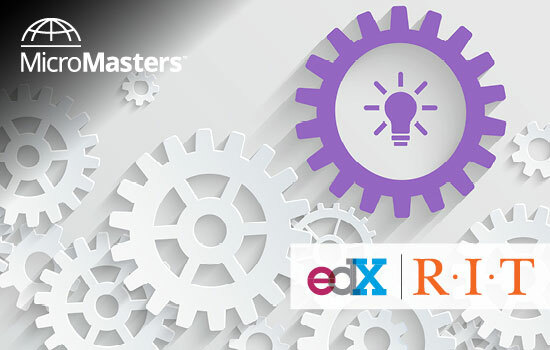 Starting in April, learners can begin the RITx Design Thinking MicroMasters program offered on edX, the leading nonprofit online learning destination founded by Harvard and MIT, and earn a credential to show employers. Upon completing the MicroMasters program, learners also have the chance to take it a step further and apply that credential toward earning an accelerated and reduced-cost master’s degree in professional studies from RIT. The Design Thinking MicroMasters program will teach learners how to use the design thinking process to solve problems creatively, collaboratively and empathetically. Design thinking was developed out of the processes used by designers—including user understanding and user experience—to address product-oriented problems. However, its application can also be used when innovating new product or service possibilities, implementing procedural change and identifying a new strategic direction for a company. “Design thinking is an inclusive process that promotes user understanding and collaborative product development process to solve problems,” said Dan Harel, an adjunct professor of industrial design at RIT who will be teaching the offerings. This graduate-level online Design Thinking MicroMasters program is designed for anyone with an undergraduate degree who wants to add more creative and strategic thinking into their career. The program could benefit professionals who work in teams, executives, managers and science, technology, engineering and math professionals looking to grow a business. Those who successfully earn the MicroMasters certificate can build on their work by applying to RIT for the master’s in professional studies program—a customized, interdisciplinary and career-oriented graduate degree. If accepted, they can be awarded nine credits for the MicroMasters certificate toward a graduate program at RIT, saving more than a quarter of the time and cost of a traditional RIT master’s program. “I hope that our learners come away from these classes with better understanding and appreciation for this integrated process, and with useful tools to help their businesses succeed,” said Harel. In 2016, RIT became one of the first universities to offer a MicroMasters program with edX. Twenty-five universities and organizations around the world are offering MicroMasters programs in other areas of study, including MIT, Columbia University, University of Michigan and Indian Institute of Management Bangalore. Details and enrollment information for RIT’s Design Thinking MicroMasters can be found at rit.edu/ritonline/ritx/design-thinking.